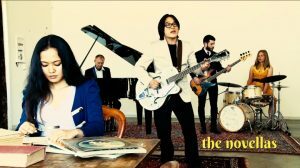 The Novellas are a six-piece band from the Bega Valley with songs inspired by contemporary fiction from Australia and beyond. Sparse & atmospheric, The Novella’s paint in song the evocations of the printed word & celebrate the emotional power of storytelling. Noted Australian actors Patrick Dickson & Tracy Mann have joined the Novellas on stage reading excerpts from the books that have inspired the songs. The Novella’s are Myoung Jae Yi on guitar and vocals, Cellestine Janiola on vocals, Andrew Gray on piano, Anna Martin on drums, Josh Becker on bass, and Georgina Hargraves on oboe & sax.